You’ll notice the term buyers and sellers used in lieu of bulls and bears when talking about market moves. This is the correct way to relate to an up or down move in the market because we really have no idea whether it’s bulls or bears moving the market. John is bullish on the market, you could call him a bull, but he puts on a short position in the ES futures to hedge his long stock positions. At the end of the day John decides to cover his short position in the ES therefore he must BUY back the amount of contracts he shorted. 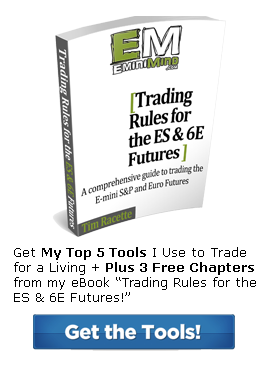 Sue is bullish on the market and get’s long ES futures at the open. At the end of the day she wants to exit her position and decides to sell. Sue SELLS her ES position to John who BUYS from Sue. John is a buyer, Sue is a seller, both have a bullish outlook on the market, but used the same vehicle in two different ways. This is just one example, but the notion of buyers and sellers versus bullish and bearish bias in the markets can bee seen on many different levels and should be taken in account when looking at time and sales data. A green buy print on time and sales could be a bull putting on a new position long, or a bear covering and buying back their short position.